This is the re-definition of automotive luxury. By 2025 the world’s automotive market will have grown by almost 30% to sales of 100 million passenger cars per year. This translates to 270,000 new cars each and every day. The F 015 is a huge 17 feet long limo-esque futuristic dream, absolutely brimming with technology and features that you would expect to see in a sci-fi movie. It has external LED lights that change colour to let you know if the car is in control. The car interacts with pedestrians and other road users. A pedestrian crossing in front of the vehicle will see the front lights acknowledging their presence whilst the back lights display the pedestrians motion to warn following drivers. Great! The vehicle even laser-projects a virtual crosswalk onto the road in front and informs pedestrians that it is safe to cross. Great! but, why? This is something that the road safety professional in me finds very scary in a world where human drivers regularly manage to kill and injure pedestrians on permanently marked and signalized crosswalks. If humans don’t stop at known permanent crosswalks, why will they stop at temporary ones? (temporary ones that don’t comply with any regulations or standards that currently exist). 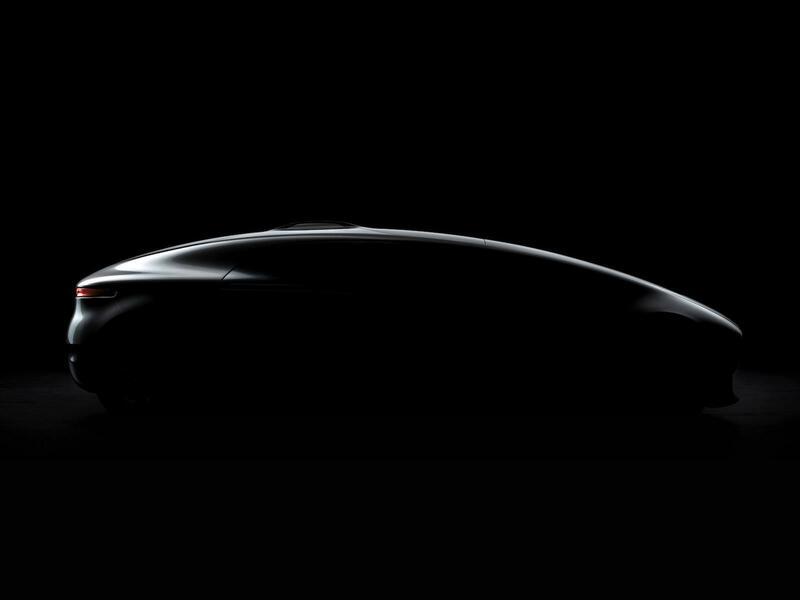 But this is a concept car, and it is expected to push the boundaries. In this instance it needn’t push any more. The vehicle interior is even more mesmerizing. 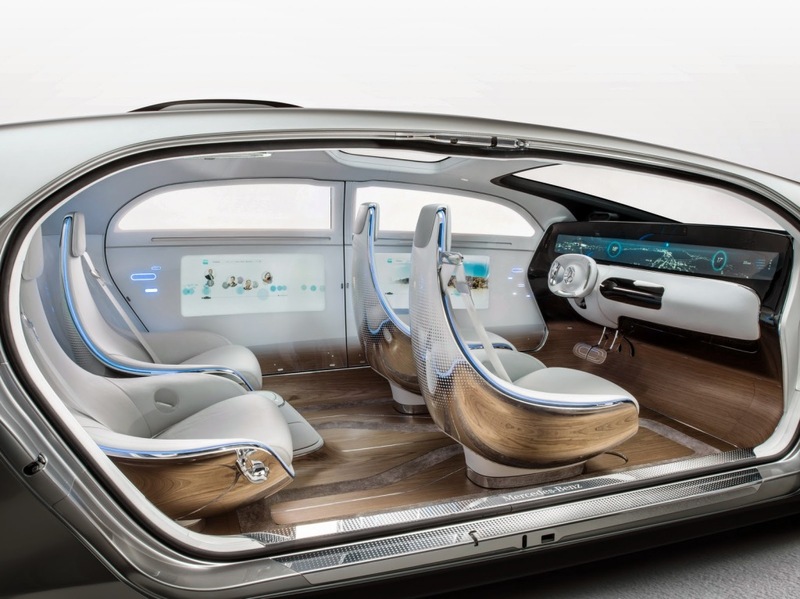 The front windscreen has a head-up-display and each of the side windows is actually a digital screen that each of the four passengers can gesture-control as they wish – even overlaying different scenery than is actually being driven through. Why? With our own smart devices and wearable technology advancing so rapidly that we can replace and upgrade at very frequent intervals, why would we want permanent and expensive technology like this in the vehicle? At the luxury end of the market this concept probably makes sense, but upgradability may still prove to be an asset. 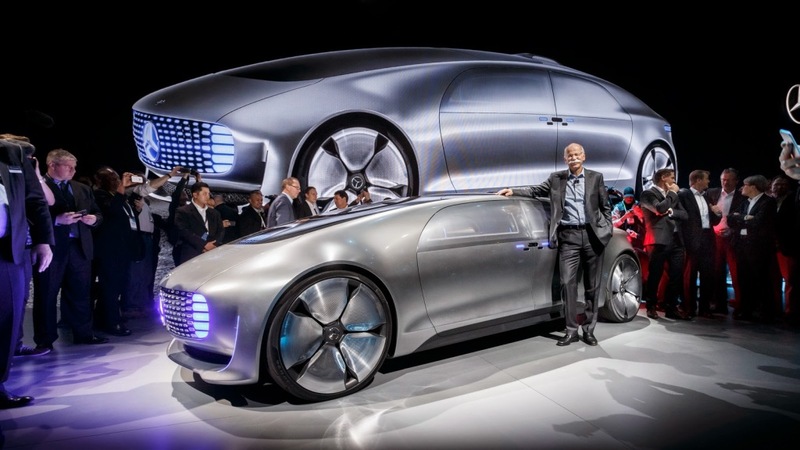 The F 015 will eventually be autonomous sometime next decade, but Mercedes say that there will ‘obviously be times when the F 015 owner wants to take control and drive themselves’, so a ‘floating’ steering and control mechanism is available that can reach any of the four seating positions. Why? Why do we want a de-skilled driver taking back control just to have fun when he/she doesn’t have the capability to drive sufficiently safely anymore? Why do we expect people to continue to own a vehicle when a much more efficient and sustainable use of the world’s resources would be to just hire the type of autonomous vehicle that we need for any particular journey? Mercedes did very briefly address this latter point when they talked about making their shared Car2Go vehicles autonomous, but it is clear that they make lower profit margins from selling small fleet vehicles than selling luxurious privately owned vehicles. The F 015 is an amazing vehicle. But it looks like it is going to be a very expensive play-thing for the rich. 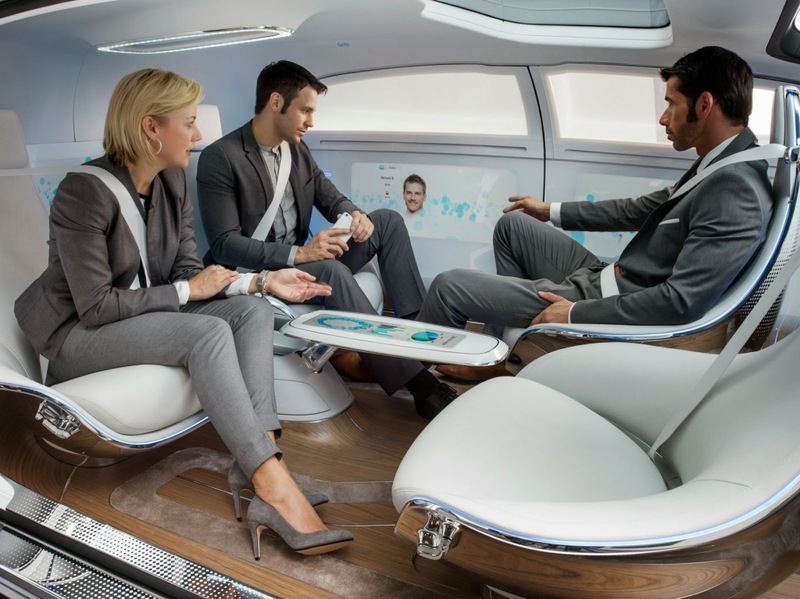 There is no harm in that, but it does seem that we will need other concepts to fully grasp the amazing socio-economic benefits that fully autonomous vehicles offer. It definitely is moving in the right direction by pushing autonomous boundaries, but seems too mired in the personal ownership paradigm to be of much use to the vast majority. Growth of passenger car sales to 100 million per year sounds like fantastic news for automotive sector shareholders, but how reliable is this forecast? Is this forecast sufficiently sustainable? We currently need 1.5 earths to provide the resources we use and to absorb our waste. By 2025 we will need 2.0 earths. With vehicles being such a huge resource-sink perhaps we should be looking much more carefully at the direction that our planet needs vehicle ownership to take? 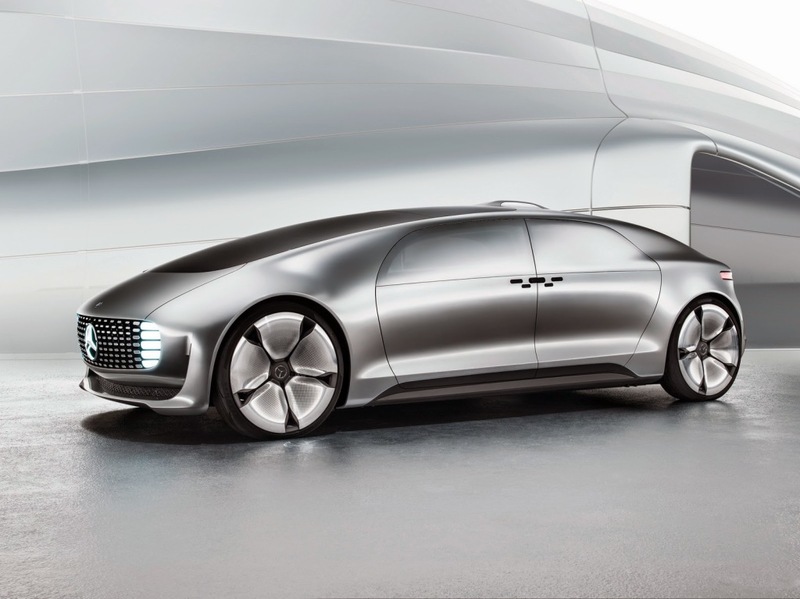 The autonomous vehicle concept that I dream of will make the roads safer, provide better and equitable access for on-demand and door-to-door transport for everyone (including many that are seniors, disabled, too poor, too young, un-licensed etc.) and be much more efficient, sustainable and environmentally friendly than the current vehicle ownership and use paradigm. Now a vehicle that satisfies that concept truly would be amazing, and be a game-changer. In a future post I will scan the horizon to see if there is reason to hope for a more accessible autonomous vehicle solution that might just transform the world.